After six years of marches, strikes and more, retail janitors organizing with CTUL have won a permanent voice across the entire industry. 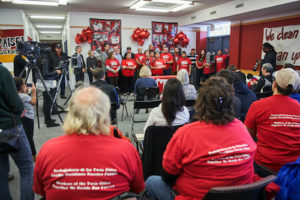 The Twin Cities is now the first metropolitan area in the entire country where the retail janitorial industry is union. Click here for a timeline of the Campaign for Justice in Retail Cleaning. Click here for facts about this victory and what it means for workers. While the majority of the retail janitorial industry is now union, one company refuses to recognize workers’ right to organize: Kimco Cleaning. Kimco cleans Kohl’s, Home Depot and JC Penney in the Twin Cities. - Kimco workers are gearing up for a major action on November 29, 2016. Click below to donate to the action fund! "Strong unions mean good jobs that help our economy work for the middle-class and those aspiring to be in the middle class. 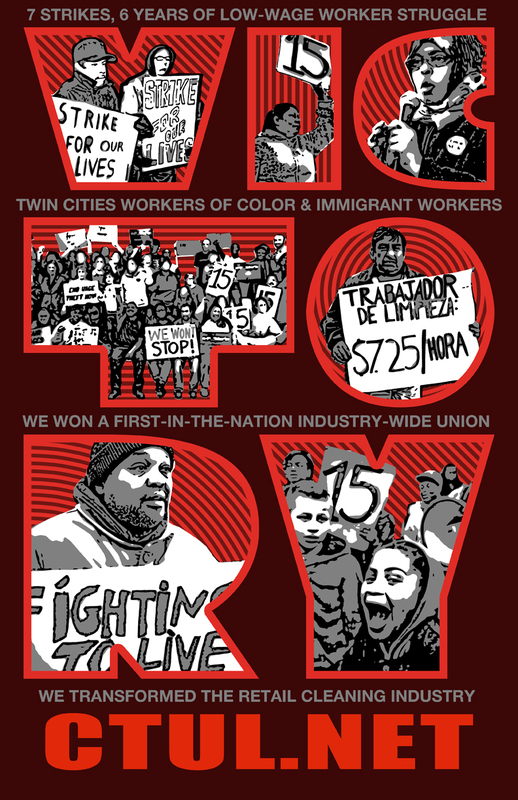 That's why I'm thrilled that after six years of organizing with CTUL to fight for their rights, Twin Cities retail janitors have won a union. 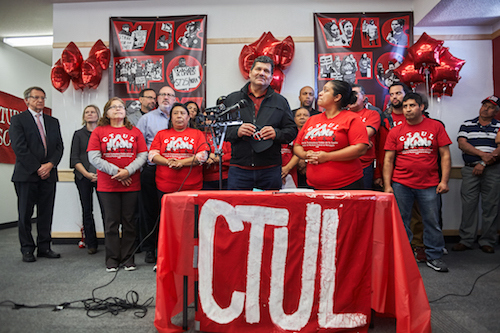 I'm proud of CTUL and the retail janitors' efforts, and that Minnesota workers will have a seat at the table to negotiate for safer workplaces, fairer wages, and better benefits." "This is a very significant victory for workers rights. I salute the work of CTUL in organizing immigrant workers who need and deserve respect, better wages and working conditions." "Despite the bleakness of national politics, good stuff is happening at the grass roots. For example, today – after a seven-year fight -- 600 janitors who clean Target, Macy’s, Best Buys, and other retail giants in Minneapolis and St. Paul have finally won union recognition. It’s the most successful effort to unionize retail store janitors in the United States, and the Twin Cities is the first major metropolitan area in America where retail janitorial workers are unionized industry-wide. They surmounted hurdles Donald Trump would appreciate -- few of the janitors speak English; they’re from many countries, including El Salvador to Somalia; many are undocumented; and many work in isolation and at night. But an immigrant workers’ center – Centro Trabajadores Unidos en Lucha (United Workers Center in Struggle) – slowly began organizing the janitors, undertaking a three-mile protest march, a 12-day hunger strike, two federal class-action lawsuits for unpaid wages, and a series of steadily expanding one-day strikes. The years of work have paid off..."
Read more from our Allies. Over the past six years, retail janitors have been organizing with CTUL to gain fair wages, fair working conditions, and a voice in the workplace. 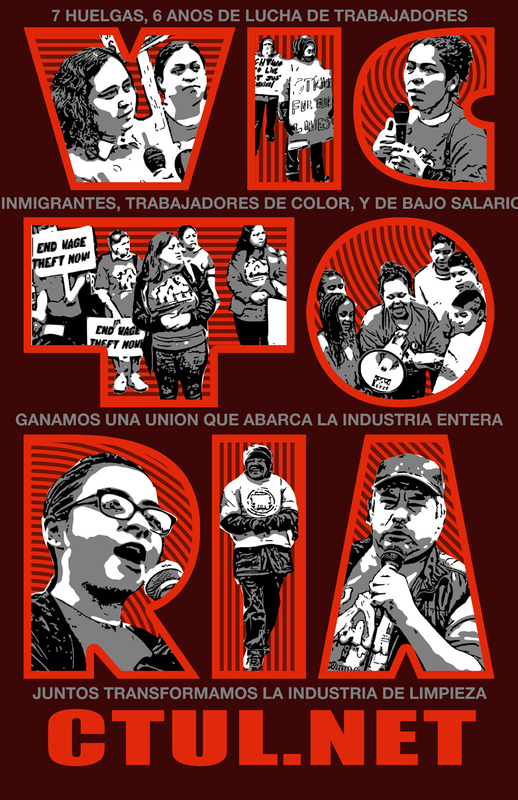 After leading marches, a 12-Day Hunger Strike, multiple strikes, and much more, workers have not only significantly increased wages, they have now won a permanent voice by unionizing the industry. CTUL started as a project of the Workers Interfaith Network (WIN) in September 2007. 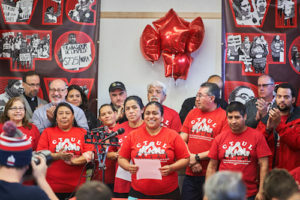 At first, CTUL partnered with individual low-wage workers who approached the organization with immediate problems they were facing in their workplaces. By far, the most common problem was wage theft – the illegal underpayment or lack of payment of wages. CTUL focused on developing the leadership of workers to know their rights, and know how to defend their rights, with the goal of providing workers with the tools to be leaders in their workplaces and in their communities. By 2009, a group of workers leaders decided that we should stop acting like firefighters putting out fires after they were already lit. Instead, we should stop the pyromaniac from lighting those fires in the first place. Rather than respond to each case of wage theft, we started exploring a way to get to the root cause of wage theft. After a six month long community investigatory process, workers chose to focus a proactive campaign in retail cleaning. The retail janitorial industry was an industry in crisis when we launched this campaign in 2010. Over the previous decade, wages had dropped by several dollars an hour while workload had nearly doubled. Wage theft was rampant – many of the retail janitorial companies had a different scheme to skim wages out of workers’ paychecks. Large retail chains would pit many cleaning companies against each other to gain contracts to clean their stores, creating the framework for a race to the bottom for wages and working conditions. It appeared that contractors that were willing to break the law by not paying minimum wage would gain an unfair advantage in the industry. Because of the fractured nature of the industry, everyone considered the industry ‘unorganizable’. We were told that this campaign was impossible. Now, after six years of organizing through a combination of deep leadership development and direct action – including a 12-Day Hunger Strike, marches, multiple strikes, and participating in corporate shareholders meetings – workers have transformed the industry. Hundreds of workers have recovered over $1.2 million in stolen wages through legal and direct action, including winning two federal class action lawsuits. Workers have increased wages across the industry by 33%, bringing an estimated $3.9 million per year in additional income into the poorest communities in the Twin Cities metro area. Two years ago, after a series of meetings between Target Corporation and CTUL leaders, Target adopted a Responsible Contractor Policy in the Contracted Cleaning of its stores. Just this year, Best Buy, Macy’s, and other major retail chains began using responsible cleaning contractors. Now workers have won a permanent voice across the industry by winning a union. Minnesota retail janitors have now become the first in the country to win an industry-wide union. Workers will begin negotiating their first contract with SEIU Local 26 within the next few weeks. While the overwhelming majority of the industry is now union, Kimco Services - the cleaning company that cleans Kohl’s and Home Depot in the Twin Cities - remains the only large outlier in the industry. CTUL and community leaders are now calling on Kohl’s to follow the leadership of Target Corporation by adopting a Responsible Contractor Policy to ensure that workers who clean their stores are treated fairly.